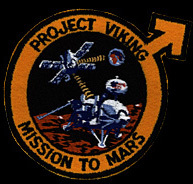 NASA's Viking program consisted of a pair of space probes sent to Mars, Viking 1 and Viking 2. Each vehicle was composed of two main parts, an orbiter designed to photograph the surface of Mars from orbit, and a lander designed to study the planet from the surface. The orbiters also served as communication relays for the landers once they touched down. It was the most expensive and ambitious mission ever sent to Mars. It was highly successful and formed most of the database of information about Mars until the late 1990s and early 2000s. The Viking program grew from NASA's earlier, and more ambitious Voyager Mars program, which was not related to the successful Voyager deep space probes of the late 1970s. Viking 1 was launched on August 20, 1975, and the second craft, Viking 2, was launched on September 9, 1975, both riding atop Titan III-E rockets with Centaur upper stages. Each spacecraft consisted of an orbiter and a lander. After orbiting Mars and returning images used for landing site selection, the orbiter and lander detached and the lander entered the Martian atmosphere and soft-landed at the selected site. The orbiters continued imaging and performing other scientific operations from orbit while the landers deployed instruments on the surface. The fully fueled orbiter-lander pair had a mass of 3527 kg. After separation and landing, the lander had a mass of about 600 kg and the orbiter 900 kg. The spacecraft was controlled by a RCA 1802 Cosmac microprocessor CPU. The primary objectives of the Viking orbiters were to transport the landers to Mars, perform reconnaissance to locate and certify landing sites, act as a communications relays for the landers, and to perform their own scientific investigations. 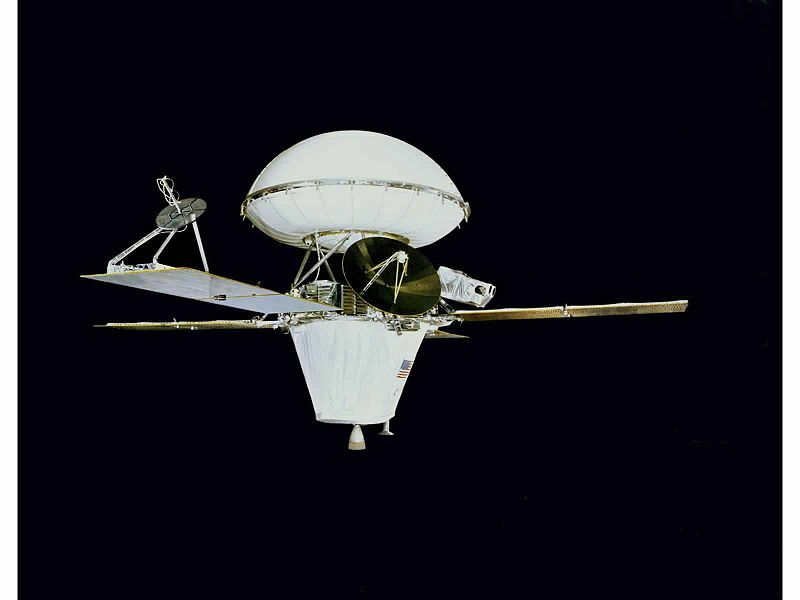 The orbiter, based on the earlier Mariner 9 spacecraft, was an octagon approximately 2.5 m across. The total launch mass was 2328 kg, of which 1445 kg were propellant and attitude control gas. The eight faces of the ring-like structure were 0.4572 m high and were alternately 1.397 and 0.508 m wide. The overall height was 3.29 m from the lander attachment points on the bottom to the launch vehicle attachment points on top. There were 16 modular compartments, 3 on each of the 4 long faces and one on each short face. Four solar panel wings extended from the axis of the orbiter, the distance from tip to tip of two oppositely extended solar panels was 9.75 m. The power was provided by eight 1.57 × 1.23 m solar panels, two on each wing. The solar panels were made up of a total of 34,800 solar cells and produced 620 W of power at Mars. Power was also stored in 2 nickel-cadmium 30-A h batteries. The main propulsion unit was mounted above the orbiter bus. Propulsion was furnished by a bipropellant (monomethylhydrazine and nitrogen tetroxide) liquid-fueled rocket engine which could be gimballed up to 9 degrees. The engine was capable of 1323 N (297 lbf) thrust, translating to a delta-V of 1480 m/s. Attitude control was achieved by 12 small compressed-nitrogen jets. An acquisition Sun sensor, a cruise Sun sensor, a Canopus star tracker and an inertial reference unit consisting of six gyroscopes allowed three-axis stabilization. Two accelerometers were also on board. Communications were accomplished through a 20 W S-band (2.3 GHz) transmitter and two 20 W TWTAs. An X band (8.4 GHz) downlink was also added specifically for radio science and to conduct communications experiments. Uplink was via S band (2.1 GHz). A two-axis steerable high-gain parabolic dish antenna with a diameter of approximately 1.5 m was attached at one edge of the orbiter base, and a fixed low-gain antenna extended from the top of the bus. Two tape recorders were each capable of storing 1280 megabits. A 381-MHz relay radio was also available. 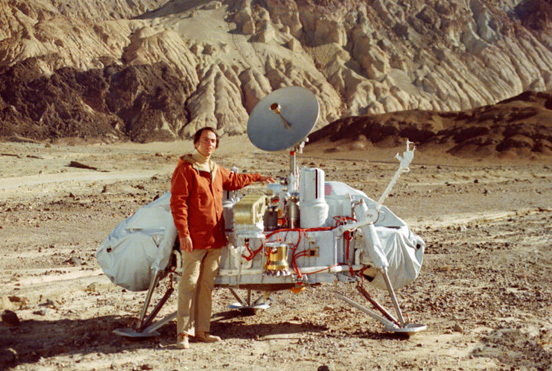 The lander consisted of a six-sided aluminum base with alternate 1.09-m and 0.56-m long sides, supported on three extended legs attached to the shorter sides. The leg footpads formed the vertices of an equilateral triangle with 2.21 m sides when viewed from above, with the long sides of the base forming a straight line with the two adjoining footpads. Instrumentation was attached to the top of the base, elevated above the surface by the extended legs. Power was provided by two radioisotope thermal generator (RTG) units containing plutonium-238 affixed to opposite sides of the lander base and covered by wind screens. Each generator was 28 cm tall, 58 cm in diameter, had a mass of 13.6 kg and provided 30 W continuous power at 4.4 volts. Four wet cell sealed nickel-cadmium 8 A·h, 28-volt rechargeable batteries were also onboard to handle peak power loads. Propulsion was provided for deorbit by a monopropellant hydrazine (N2H4) rocket with 12 nozzles arranged in four clusters of three that provided 32 N thrust, giving a delta-V of 180 m/s. These nozzles also acted as the control thrusters for translation and rotation of the lander. Terminal descent and landing was achieved by three (one affixed on each long side of the base, separated by 120 degrees) monopropellant hydrazine engines. The engines had 18 nozzles to disperse the exhaust and minimize effects on the ground and were throttleable from 276 N to 2667 N. The hydrazine was purified to prevent contamination of the Martian surface. The lander carried 85 kg of propellant at launch, contained in two spherical titanium tanks mounted on opposite sides of the lander beneath the RTG windscreens, giving a total launch mass of 657 kg. Control was achieved through the use of an inertial reference unit, four gyros, an aerodecelerator, a radar altimeter, a terminal descent and landing radar, and the control thrusters. Each lander was covered over from launch until Martian atmospheric entry with an aeroshell heatshield designed to slow the lander down during the entry phase, and also to prevent contamination of the Martian surface with Earthly microbial life that can survive the harsh conditions of deep space (as evident on the Surveyor 3 moon probe). As a further precaution, each lander, upon assembly and enclosure within the aeroshell, were "baked" at a temperature of +250 °F (120 °C) for a total of seven days, after which a "bioshield" was then placed over the aeroshell that was jettisoned after the Centaur upper stage fired the Viking orbiter/lander combination out of Earth orbit. The methods and standards developed for planetary protection for the Viking mission are still used for other missions. Communications were accomplished through a 20-W S-band transmitter and two 20-W TWTAs. A two-axis steerable high-gain parabolic antenna was mounted on a boom near one edge of the lander base. An omnidirectional low-gain S-band antenna also extended from the base. Both these antennae allowed for communication directly with the Earth. A UHF (381 MHz) antenna provided a one-way relay to the orbiter using a 30 W relay radio. Data storage was on a 40-Mbit tape recorder, and the lander computer had a 6000-word memory for command instructions. 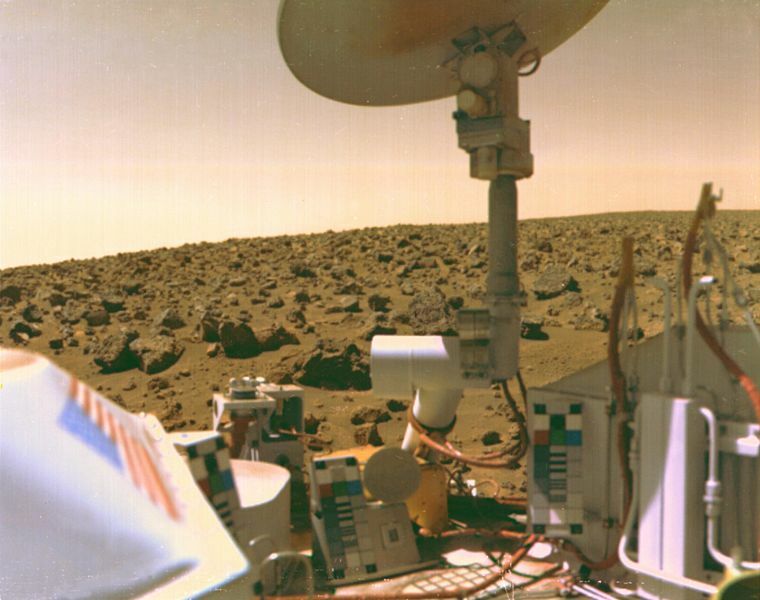 The lander carried instruments to achieve the primary scientific objectives of the lander mission: to study the biology, chemical composition (organic and inorganic), meteorology, seismology, magnetic properties, appearance, and physical properties of the Martian surface and atmosphere. Two 360-degree cylindrical scan cameras were mounted near one long side of the base. From the center of this side extended the sampler arm, with a collector head, temperature sensor, and magnet on the end. A meteorology boom, holding temperature, wind direction, and wind velocity sensors extended out and up from the top of one of the lander legs. A seismometer, magnet and camera test targets, and magnifying mirror are mounted opposite the cameras, near the high-gain antenna. An interior environmentally controlled compartment held the biology experiment and the gas chromatograph mass spectrometer. The X-ray fluorescence spectrometer was also mounted within the structure. A pressure sensor was attached under the lander body. The scientific payload had a total mass of approximately 91 kg. The total cost of the Viking project was roughly one billion United States dollars. Viking 1 lander 20 July 1976 13 November 1982 6 years, 3 months, 22 days Human error during software update that caused the antenna to go down causing the termination of communication with the lander. The whole of the Viking program was finally shut down on 21 May 1983. The Viking landers conducted biological experiments designed to detect life in the Martian soil if it existed with experiments designed by three separate teams, under the direction of chief scientist Gerald Soffen of NASA. The results were initially positive and one experiment met all NASA's criteria for the detection of life. But, based on the results of another test that failed to reveal any organic molecules in the soil, most scientists became convinced that the results were likely caused by non-biological chemical reactions from highly oxidizing soil conditions. Although there is general consensus that the Viking Lander results demonstrated a lack of robust microorganism biotas in soils at the two landing sites, the test results and their limitations are still under assessment. The validity of the positive 'Labeled Release' (LR) results hinged entirely on the absence of an oxidative agent in the Martian soil, but one was recently discovered by the Phoenix lander in the form of perchlorate salts. The question of microbial life on Mars remains unresolved.